"The item going the rounds of the grand jury at Carthage had indicted a father and son for larceny is incorrect. The facts are these. 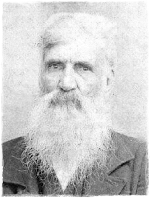 A white man by the name of Isham Wallace was taken before the Justice of the Peace upon the charge of stealing a sheep, his own son being the prosecutor. At the trial Wallace procured a warrant for his son, charging him with stealing (Wallace's) clothes. After hearing the evidence the Justice bound both father and son to the next Term of the Superior Court. The son was jailed not being able to give bond. The father afterwards mortgaged his property and secured bail for his son. The son is trying to get his father in the penitentiary and the father is trying to get his son there. The Justice thought that they both should go. The father is prosecuting the son, and at the same time procured bail for his appearance at court. It is somewhat a family affair." "Perhaps the most amusing cases tried at the late tern of court were the two which Lias Wallace indicted his father, Isham Wallace, for stealing sheep, and the father had a countersuit against the son for stealing a suit of clothes. The old man was called up first to testify against his son. He knew nothing about his son's connection with the theft of his clothes. As the State could make no case, at the suggestion of the Solicitor the prosecutor was taxed with the cost. Lias was next called to testify against the old man. He never owned a sheep, never saw the old man with one, and knew nothing about anybody stealing a sheep. In fact from his appearance, one would suppose that he had never seen a sheep. He was also taxed with the cost. While coming to court Monday morning Lias was met by a gentleman who enquired what was going to be done about the case and replied "The old man is going to do all he can to get me off, and I'm going to do all I can to get him off, but what I said about the old man stealing the sheep is so, I be d--n if he didn't steal him" Book these men are bad characters. The son ran away the day after the trial to avoid arrest for another offence."